Wrapper, Binder, Filler, all Dominican. No further details. Appearance is rough. Several prominent veins, visible seams, dark brown, toothy wrapper. Pack is firm. This is a heavier and more fully packed cigar than the others. Smell again is light, tobacco, a little barnyard. Draw is much tighter than any of the other cigars in this collection. A little over-tight for my taste, but some people like it this way. On initial light there is only a little pepper, some vegetal or meaty note. I’ve tasted this before, something characteristic of Dominican cigars that I never taste in Nicaraguan smokes, something sour on the back of the tongue with a sensation not unlike red pepper. Some people go after this taste and there are cigars that have even more of it. But this sourness stays distinctively up-front throughout the smoke and it isn’t something I particularly care for. I didn’t get any of this note in the first three cigars from this sampler. Construction stays good. I had to make a few minor corrections to the burn. The draw is too tight for me, but it stays consistent. Smoke volume is not as good as the other sticks in this sampler, but this improved about half way down the smoke. It helps to have a draw tool as these often improve smoke volume even when you don’t need them for the draw itself. Other flavors in the first third include some sweet notes, something like mint, and as the cigar progresses, leather, a sweet burning wood and roasted vegetables. But over it all is still that sour note on the tongue. Pepper stays mild and consistent until the last third where it begins to come up strongly. 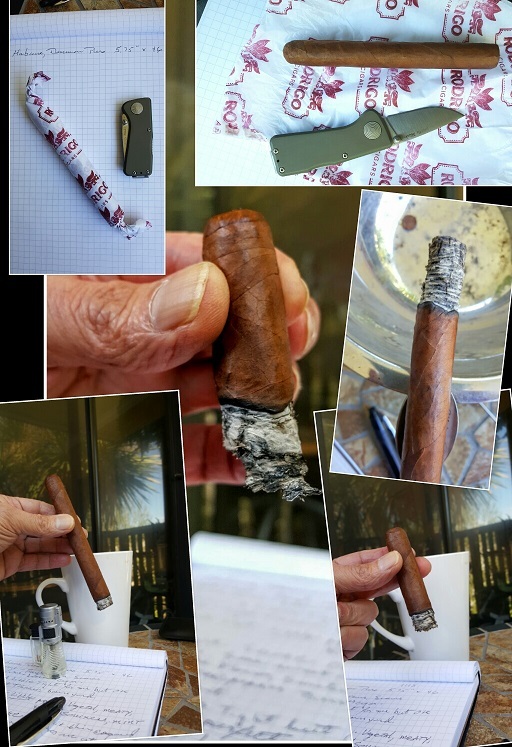 The cigar also goes from the medium to the medium-full range in strength. Unusually, there is less pepper on the retrohale and more sweetness than on the tongue until the cigar gets into its final few inches. Interestingly, the retrohale has none of the sourness I sense in my mouth. As the cigar gets into the last few inches the draw opens up a bit, smoke volume improves. The flavors remain, especially leather and the sweet note of burning wood, but they all dial back. Pepper comes up on both the tongue and in the retrohale, but behind it all remains that sour note consistent throughout. I got down to almost the last inch. There is still flavor in the cigar, especially if you like what comes across to me as that sourness. There is lots more pepper now in the retrohale. Strength picks up. I can feel the cigar now and if I smoke much more it would make me dizzy. Another slow smoker, this stick went 1 hr. 25 minutes!